Once the training is over, these youths are qualified to work in any mining industry as jumbo drill operators, load haul dumper (LHD) operators and low profile dumper truck (LPDT) operators. HZL itself engages about 200 jumbo drill operators and 45 winding engine operators. 98% retention rate in different companies proves rural youth need skilling to become employable in different sectors. The difference between a developing nation looking to build itself on the bench strength of mining industry and a developed economy is the availability of skilled workers, which is facing a serious deficit with the growth of mining projects in India. 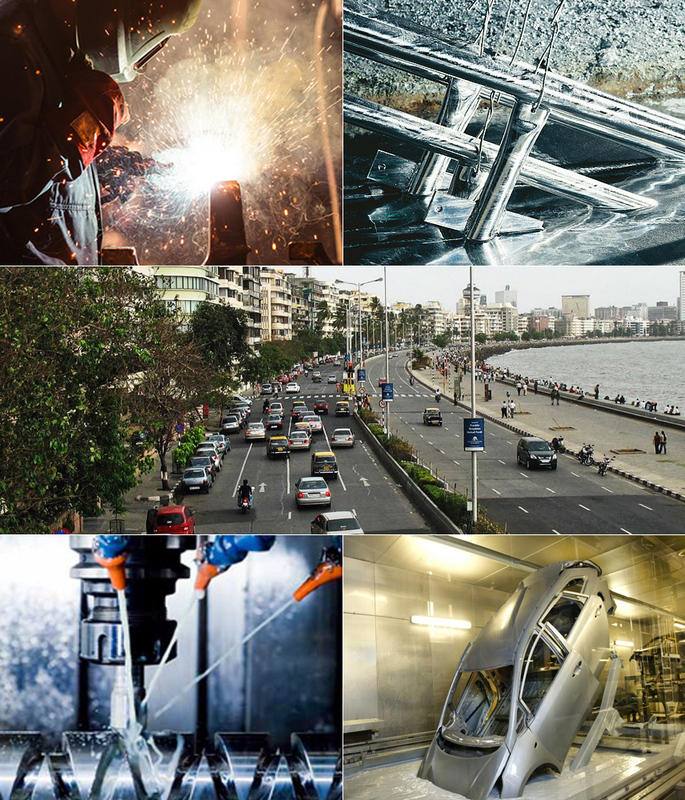 Over the last 10 years, the natural resources industry in India has seen significant challenges in terms of shift in technology, employment generation, metal production and attracting the best of Indian and global talents. This has resulted in huge demand for skilled workforce who can operate sophisticated mining equipment such as jumbo drill, load haul dumper (LHD) and low profile dumper truck (LPDT) among others. To meet this growing demand, many international experts have joined on key positions to explore natural resources, improve metal recovery and build a future of sustainable mining. Hindustan Zinc, India’s only and world’s leading integrated producer of zinc, lead and silver has set up Hindustan Zinc Mining Academy in collaboration with the Skill Council for Mining Sector and the training partner, Indian Institute of Skill Development Pvt Ltd.
Jumbo drill operators and winding engine operators have emerged as two distinct roles where the need for Indian skilled manpower could be deployed. These are currently being operated by expats at very high cost. Hindustan Zinc itself engages about 200 jumbo drill operators and 45 winding engine operators through business partners. The opportunities are set to move up with an increase in expansion of mines. The Mining Academy was started as a Corporate Social Responsibility (CSR) initiative on August 1, 2014 where trained 55 ITI/Diploma pass-outs in the jumbo drill got immediate placements. The vision was to provide a platform to local youth for developing highly specialised skills to operate the latest and the most advanced equipment used in underground mining operations, while making them self-reliant and opening paths for sustainable livelihood. After the success of program, Hindustan Zinc envisioned and made the program more robust with quality changes. Currently, the academy runs three centres at Bhilwara, Rajsamand and Zawar near Udaipur, with more than 200 candidates from all over Rajasthan. The CEO of Hindustan Zinc, Sunil Duggal, who is also the Chairman of Governing Board of ‘Skill Council for Mining Sector’ informed that Hindustan Zinc completely endorses the prime minister Narendra Modi Ji’s thoughts on the scope of creating millions of employment opportunities through natural resource sector. 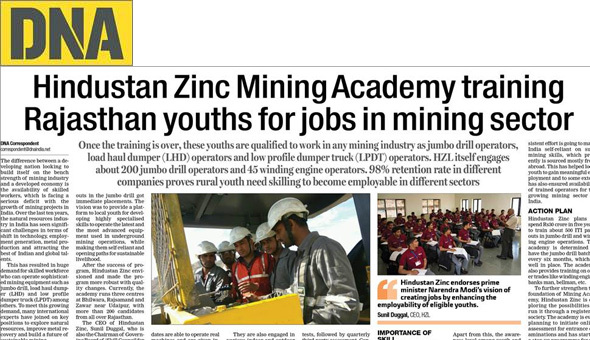 “The prime objective of setting-up Hindustan Zinc Mining Academy is to enhance employability of eligible youths,” he said. This Academy will provide Jumbo Drill Operators and Winding Engine Operators to India’s mining industry, who would also have training in Banks-men and Bellman Operations. The company is set to invest Rs. 30 crore in five years on the training programme. Hindustan Zinc extends high-tech facility for VTC training, 3-D simulation, and hands-on training for learning maintenance and operations required in underground mines. The candidates are able to operate real machines and are given industry exposure before they complete the course as per requirement. Hindustan Zinc also engages experts from its locations for taking expert faculty interface classes periodically, and also invites its business partners for engagement with candidates. Hindustan Zinc Mining Academy is a fully residential training program with provision for free boarding and lodging facilities for all the selected candidates in both the training programs. Equal emphasis is also given on soft skills, team effort, discipline, quality of life and overall personality development, which would further help them in securing sustainable livelihood in future. Recently, special township has been developed for the trainees that is equipped with hi-tech facilities like Jumbo washing machine, centralized air conditioner, well-furnished canteen, to name a few. They are also engaged in various indoor and outdoor sports – cricket, volleyball, badminton, chess, carrom board, football, etc. The ITI pass-outs and diploma holders who are below the age of 30 years and who are qualified to operate equipment through training are being invited through advertisements in prominent newspapers. All applicants after submitting application forms online appear for written test based on aptitude, IQ, English proficiency test etc. Successful participants then clear other selection formalities before appearing for interview. Also, all existing trainees act as brand ambassadors and communicate through their channels. The training assessment has inbuilt weekly and monthly tests, followed by quarterly third-party assessment. Candidates successfully fulfilling passing criteria each month and in the third-party quarterly assessment are being awarded with National Skill Qualification Framework (NSQF) certifications based on the series of knowledge, skills and aptitude. Certification based on National Occupational Standards is also facilitated by Skill Council for Mining Sector (SCMS) after third-party assessment to the enrolled candidates who successfully complete the program. The candidates are given stipend ranging from Rs 2,000 to Rs 7,000 and also performance top-up based on their attendance and assessment performance, which motivates high performers to give their best. Further, to boost the confidence, centre-wise toppers and overall toppers are also given cash reward on quarterly basis, ranging Rs 5,000-10,000 during the course. According to the McKinsey Global Institute, over the last decade, the contribution of mining to India’s GDP has fallen from 1.2 per cent to one per cent. If properly tapped, the mining industry could help propel growth for the country over the next decade. In fact, the performance of mining sector will be an important factor for India to achieve over seven per cent GDP growth. The mining industry has the potential to create six million additional jobs by 2025, accounting for 12 per cent of the new non-farm job gap. India needs to create an additional 150 million non-farm jobs by 2025, to significantly reduce poverty, and empower people. It is also need to be highlighted that there are no relevant courses available in mining space for the candidates to pursue. Apart from this, the awareness level among youth and quality of education are other bottlenecks to meet the required skills. Mining workforce is crucial for sustainable development of the sector, especially as there could be incremental demand of 1.5-2.5 times of the current workforce by 2025. To bridge the imminent shortage of human resource in mining sector, there are two possibilities that can be considered: increase the number of seats in mining engineering in relevant institutes over the next 10-15 years. The second solution is to devise short-term mining-specific courses for ITIs/diploma holders in mining states by facilitating private sector participation in skill development for the mining sector. Setting up India’s first Mining Academy, Hindustan Zinc is developing an ecosystem and unlocking India’s potential in mining. A consistent effort is going to make India self-reliant on such mining skills, which presently is sourced mostly from abroad. This has helped local youth to gain meaningful employment and to some extent has also ensured availability of trained operators for the growing mining sector in India. Hindustan Zinc plans to spend Rs 30 crore in five years to train about 500 ITI pass-outs in jumbo drill and winding engine operations. The academy is determined to have the jumbo drill batches every six months, which is well in place. The academy also provides training on other trades like winding engine, banksman, bellman, etc. To further strengthen the foundation of Mining Academy, Hindustan Zinc is exploring the possibilities to run it through a registered society. The academy is even planning to initiate online assessment for entrance examinations and has started a step-up programme for rural youth residing near Hindustan Zinc’s business locations. This is a pre-coaching program to encourage and prepare these youth for entrance examination to join the course. The Academy also organized 1st convocation of 150 students that includes 103 Jumbo Drill operators and 1st batch of 47 Winding Engine operators on 24th January 2018 in Udaipur. These candidates have been recruited by companies like SK Khetan, BGE Mining Pvt Ltd, SMSL, Aravali Construction Co, Teknomin Construction Limited, UTM Engineering Pvt Ltd, AAC Mining Executors India Pvt Limited, to name a few with an average salary of Rs. 300,000 per annum. There has been 98% retention rate only proving that rural youth needs employability and they are ready to learn skills that can be used in the current sectors.